July 16 is National Personal Chef Day. I wasn't sure how I was going to celebrate this day because I don't actually have a personal chef. When we first moved into our house over 15 years ago, we invited our Italian friends over for dinner. I was going to make spaghetti, garlic bread, and salad. Easy enough. They arrived a little bit early and saw me tearing open the bag of pre-made salad. They looked at the pot of water on the stove and the dry spaghetti noodles and Jim said to me, "Point me to your spice rack and step aside". Twenty minutes later dinner was served and my only question was "Did we have all of this in our house?" Knowing how to use spices can make all the difference. My son has been watching the Food Network and has been trying out all kinds of new recipes. And again they leave me wondering "Did we have that in our house?" It is amazing what the right spice can do for a recipe. My only question was if spices go bad. So, this last week we went through the spices and made sure everything was reasonably fresh. Some spices were so old I knew for sure they came from our previous home. We are super organized now and ready for some spicy cooking. When my kiddo gets a place of his own I know exactly what we are going to get him for a housewarming present and that will be a really cool spice rack loaded with great spices. Even still, National Personal Chef Day was passing me by fairly quietly today when all of a sudden there was a knock on our door. My friend Angie just got a new mixer and she had read on my twitter account that it was National Personal Chef day. 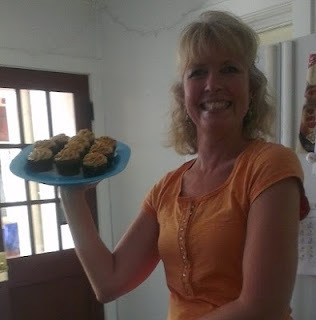 So, she brought us a plate of decadent chocolate cupcakes to celebrate. Thank you Angie for making National Personal Chef Day a memorable one this year! Here's hoping you have had a spicy National Personal Chef Day ~ And many more to come.